Let's take a look what "Unbowed" is doing. Start with the basics. "Unbowed" is a short story in three serialized parts introducing the character of Vivien Reid and her legendary weapon the Arkbow. Vivien Reid is from a world that Magic's current biggest bad Nicol Bolas blew up for reasons that are not made clear within the story itself. The Arkbow is a bow whose arrows summon various organisms stored inside it. It was made on Vivien's destroyed home world, and primarily contains creatures from that plane, though she's picked up some others here and there apparently. 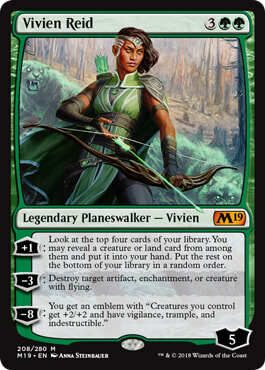 She's apparently not the only person who can wield the Arkbow, except she of course actually is, because everyone else got torched by Nicol Bolas. The origins of the Arkbow are otherwise not delved into here. Already in talking about what the story is doing we're starting to see a ghost emerge of what the story is not doing, the textual negative space. But hold off on that for the moment. Here's something people of The Internet always love: a Too Long; Didn't Read (or "TL;DR" for the very very impatient). 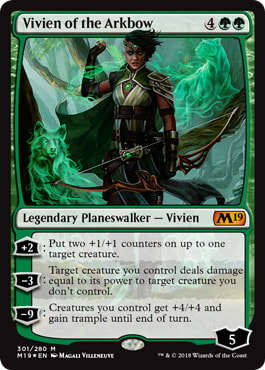 Vivien Reid is on Ixalan. She's helping some vampires capture dinosaurs for their menagerie, it seems, somewhere (if I'm parsing things correctly) off the coast of Torrezon, the secondary continent of Ixalan. She is taken on a tour of the city of Luneau, and gradually grows more and more disgusted with what she sees, until finally, watching a bunch of the vampire nobility torment a dinosaur for entertainment, she unleashes the power of the Arkbow, summoning some big monsters into the palace grounds. She does some serious damage, but she is captured and the bow is taken from her. The Baron, a scientifically minded man, tortures her for information on the Arkbow, while also testing its capabilities. After torture doesn't work, he has some nuns clean her up and sticks her in a much nicer room where Vivien is tortured by boredom, which works better. Finally released from the cell, she agrees to attend another vampire party, where the dinosaur from earlier is being vivisected for the nobles' amusement. She explains to the Baron that the reason his tests don't work is because the Arkbow will only work for her, and the two exchange verbal repartee for a bit before he finally agrees to let her demonstrate the bow's power. A barrier erected around her and the vivisected dino, Vivien precedes to draw the creature's spirit into the bow. A guard is ordered to try and summon it with the bow. He explodes. A spider crawls out of his pocket, however, and Vivien uses the opportunity to cast Giant Growth on it. In the subsequent confusion of a 4/4 spider token appearing in the room, Vivien uses the bow to summon the spirit of the dino, which eats the Baron. She liberates the menagerie, casting Overrun or something like it and, as the card name suggests, overruns the city. Her work of setting a bunch of angry dinosaurs loose in a populated area done, she leaves for Shiv, because she wants a pet dragon (a universally relatable emotion). The story obviously compresses down into fairly manageable chunks for those who decided it was Too Long, and consequently Did Not Read. There are many things that do not constitute the nuclei of the story, the specific actions and choices propelling the plot forward that make "Unbowed" this plot and not some other plot. But those things aren't extraneous to the meaning of the story. Still, let's take a look just at these nuclei and what they tell us about what "Unbowed" is doing. "Unbowed", in simplest form, takes us from Vivien willingly working with the vampire aristocrats of Luneau to unleashing a bunch of hungry monsters on them, then going off to find more even beastlier beasts. "Unbowed" also takes us from a point where the vampire aristocrats are in control of a situation, to losing control, to gaining an even greater control over Vivien, before losing control completely. This is just what's happening on a plot level, on the level of those nuclei. So, this has a point in that it introduces both Luneau and Vivien Reid at a particular narrative point in time, getting us familiar with those states, and then going through a series of operations to change their state and introduce a new status quo, where Vivien Reid is going off to find real big monsters, and a bunch of vampires are going through the intestines of some dinosaurs. Let's jump up a level. We've been looking at the story itself, but this story is also part of a larger system of stories, a whole metatext that these plot beats might serve in some way. What's "Unbowed" doing from that perspective? Well, it's doing pretty much exactly what I just said it was doing: introducing character and setting in a particular state, and shuffling things around to leave them in another state. But rather than just being a self-contained narrative that follows this path, from this larger perspective the story's function is to introduce the reader to new information about a formerly seen world, and a new character that may appear in the future. The conclusion of this story also serves as a prelude to whatever Vivien does next, something that will prompt future action: getting bigger monsters, and probably smashing bigger cities. While I've noted before that this can be risky, since it's never certain whether a serial narrative as sprawling as Magic's will return to a character introduced this way, and following along with such character introductionsrequires faith that the payoff with be worthwhile, I think it should be clear from the stripped down summary that "Unbowed" works solidly on the two narrative levels that Magic‘s Story has to accommodate. We've got an introduction to who Vivien Reid is and how she sets off on her presumably current quest for big monsters, but this introduction also isn't a flat statement of her character. It's easy to fall into that mode, just showing off the character fully formed on an adventure designed to showcase their skills, but this story actually gives Vivien a progression from one state to another, and so is interesting in its own right. Specifically, she goes from not understanding why Nicol Bolas would destroy a whole plane to kinda getting the impulse. It's not, like, a nice character progression. And what about all the other stuff in the story that I cut out of the TL;DR summary? Well, that's where the logic behind her change of state becomes clear. These narrative indexes convey information not about the core action of the plot, but about other stuff, like what specifically makes Luneau not great, and what propels Vivien forward through the plot. It is the logic behind each character beat. It allows for other subtler arcs within the narrative, such as Vivien's realization that she needs to better adapt her navigation of the world and her magic style to protect the Arkbow from being taken from her. It opens up the pleasures of the text, allowing the game of power and control between Vivien and her vampire captors to play back and forth before reaching its conclusion. Oh, and it's stylistically interesting. This is a way it functions in the broader Magic narrative: it allows for a tonally and stylistically different text. There's no denying it, Cassandra Khaw's writing style is a far cry from the quippy, Whedonesque style of previous Magic Story offerings, much closer to the heavy, portentous, often pretty weird offerings of J Robert King (which Khaw seems to admire). This makes perfect sense to me. An infinite multiverse with such a vast array of possible stories should have a similarly wide array of possible narrating voices. There's something sick and feverish about the twisting, sometimes difficult to immediately parse descriptions and the way story segments abruptly smash cut from scene to scene, and this fits with the sweltering city ruled by the dead, in which Vivien, a ghost from a dead world, wanders. What this is not, of course, is a lore dump on a bunch of stuff Bolas has been doing. It isn't designed to Move The Plot Along. It's not even designed to move its own plot along that fast, really. It's not hypercompressed the way that, say, Dominaria's story had to be. That's . . . actually ok? I'm not sure in fact why that would not be ok. Just as within a narrative not every utterance has to be compressable into the essential tl;dr, so too is it true that within the wider narrative of Magic not every story has to exist simply to push the central conflict forward. I mean I guess you could demand such a thing, but at that point are you even engaging the story itself, or just its tl;dr version? The great interest of a massive shared world fiction like Magic is that there can be stories that function not as nexuses within the larger narrative but instead give us other forms of textual information and aesthetic pleasure. "Unbowed" is still doing things narratively, even if they're not the things you might have anticipated. It's worth taking the time to understand them on their own terms.